I am about to make your day with the perfect reason to quickly gather the ingredients for this recipe and feel good about the snack you’ll prepare! Did you know pumpkin is a vegetable and just ½ cup of 100% pumpkin puree equals 1 vegetable serving? Pumpkin puree moves up a couple of shelves at the grocery store this time of year, but it is actually available all year long. Inevitably though, as soon as you flip your calendar from September to October something magical happens. As you stare at those cute Jack O’ Lanterns scattered everywhere your mind gravitates towards pumpkin flavored deserts and drinks. Here are a few more cool facts about 100% Pumpkin Puree. It is low in calories with just 40 calories in ½ cup serving. It is also low in fat and high in vitamin A with 80% as Beta-Carotene, a powerful antioxidant. It is an excellent source of fiber and it is naturally sodium-free and gluten-free food. This time of year I prepare a batch of Pumpkin Peanut Butter Spread which I usually use in bagels, toast and graham crackers for breakfast. It is simple with just equal parts of Once Again Creamy Peanut Butter (or Almond butter) and 100% Pumpkin puree, mix it well and store it in a glass jar in the fridge (I use one of my recycled Once Again jars). The richness of this spread made me think of pumpkin pie, and my favorite way to enjoy pumpkin pie is with a huge dollop of vanilla ice cream. But how about a pumpkin pie type recipe that I can enjoy more than just on Thanksgiving Day? A recipe that won’t max out my total caloric intake while providing some protein, fat and fiber so it serves as a breakfast or afternoon snack. Easy, let’s swap the ice cream for Greek yogurt and eliminate the baking step in the pie recipe to make it much easier and fast to make. Also by preparing it in a cup you can enjoy it right out of fridge any time you’d like. The Once Again Nut Butter increases the protein, fiber and mineral content while adding so much flavor to this version of pumpkin pie. 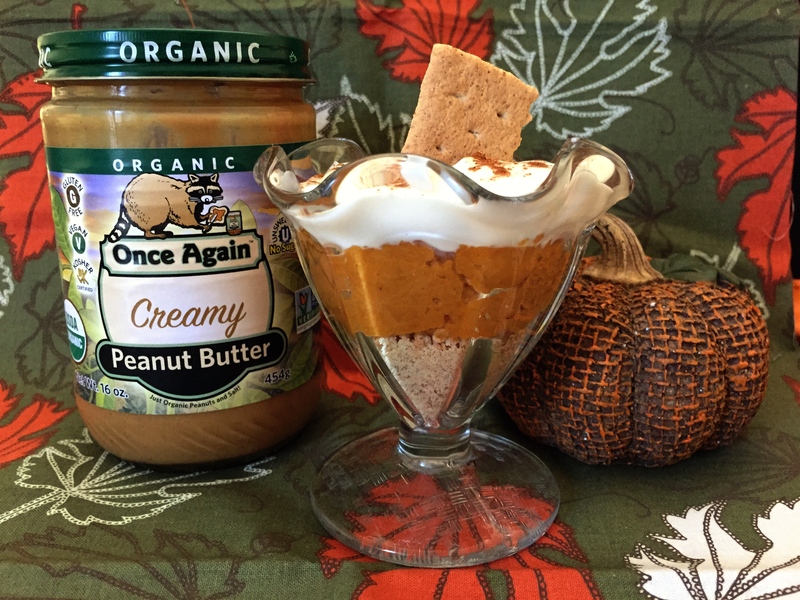 Enjoy this No-Bake Pumpkin Pie in a Cup recipe any time of day, and remind yourself you’re working on increasing your daily vegetable intake as you devour this treat! Mix pumpkin puree with Once Again Creamy Peanut Butter well, then add in the pumpkin spice. Place the Graham crackers in plastic sealed bag and crush them using the back of a wooden spoon (or just your hands works too!). Start layering the crushed crackers, then the pumpkin peanut butter mix and lastly top it off with the Greek Yogurt. You may need to adjust quantities to fit your cup or jar. Enjoy! Feel free to experiment with your favorite Once Again Nut Butter, this recipe will work really well with Sunflower Seed, Cashew and Almond Butter as well. 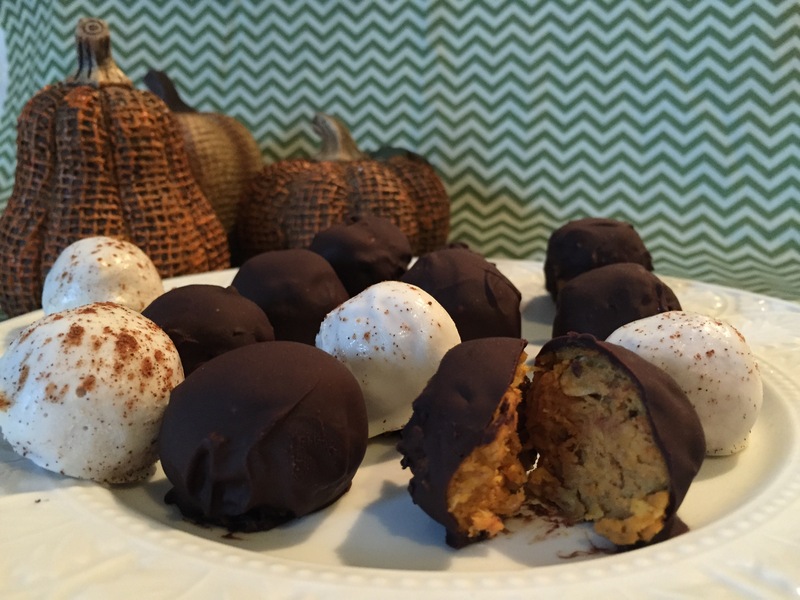 DIY: Make your own Peanut Butter Pumpkin Truffles! Check out my short video below. I hope you too get inspired to make your own truffles. Mix Pumpkin puree and peanut butter first, then add oats (you may use rolled oats, just put them in the food processor first to achieve a coarse oat flour) and pumpkin spice. I thought the sweetness of the pumpkin and nut butter was enough, but if you are looking for a sweeter truffle, you may add a couple tablespoons of brown sugar. Roll them up and dip into melted chocolate. Place in freezer for just 10-15 minutes. Enjoy them! I have recently shared some recipes that included Tahini as an ingredient. My family really enjoyed taste testing the recipes as I worked on them, and I have made some of the recipes a few times already for second trials. I was so inspired with my new found love for Tahini that I went a little overboard and stocked my pantry with a few jars. Which lead me to further explore how else I can use this delicious sesame seed butter. I turned to my trusted friend “the internet” for some answers. I’ll go through some of the ideas I found, and which ones I have tried so far. Through my research I confirmed that tahini can serve as a replacement or alternative to most nut and other seed butters in recipes. Since tahini has a consistency similar to that of peanut butter, it is very versatile. It does not have the sweetness of nut butters and can be more easily used in entrees and soups. So here are a few suggestions, and since we love new ideas and challenges, share yours if you have one to add to this list! Simple but often overlooked: Just spread it on crackers or toast! My kids approved and enjoyed tahini paired with fruit jam as a sandwich. It can be used instead of mayo on a turkey and cheese sandwich, a veggie wrap, falafels or on a chicken Panini. As a salad dressing. In addition to the lemon juice and tahini add a few teaspoons of extra virgin olive oil, some salt, a little garlic or ginger and you’ll have a thick and creamy salad dressing that is far more nutritious than cream based dressings. It is perfect for Greek Salads, but will also go well with any salad combination. Here is one I have tried at home and thought it was a winning combo: ½ cup tahini, ½ cup olive oil, 2 tsp apple cider vinegar, 2 tsp lemon juice and 2 tsp of ginger. Mix in blender and save left overs in refrigerator. Thicken your soups. I tried this one too! Instead of heavy cream on my broccoli and cheese soup recipe, I added a few tablespoons of tahini and achieved the same thickness with less dairy. If you are trying to cook without any animal product, but have been missing creamy soups, this may just be your answer! Start by adding one tablespoon at a time until you achieve the creaminess you prefer. Tahini is most commonly used in hummus recipes. Traditional hummus calls for garbanzo beans, but this is not the only way to make hummus. I was adventurous to try all different kinds of hummus lately. The tahini and olive oil should be used in the same proportion as usual, but you can vary the legume/vegetable variety in your recipe to make a brand new hummus. So far I experimented with edamame, pinto beans, eggplant, lima beans and white beans. Use it in cookies and cakes recipes in place of nut butter. I have not tried this one yet! I found several recipes online suggesting you can substitute one to one on any recipe that calls for a nut butter. As you can imagine I will have no trouble going through my stash of Once Again Organic Tahini, and will probably be stocking my pantry on a regular basis! Have fun discovering your family’s favorite way to enjoy tahini! 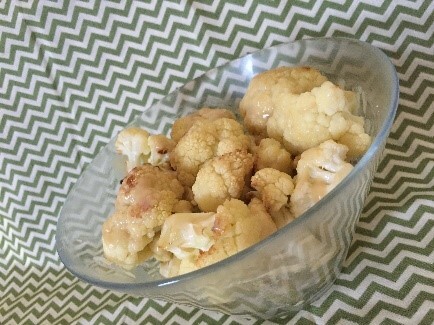 Wash and cut your cauliflower, then toss it in 2 tsp of extra virgin olive oil, place in oven (400F) and roast for about 15 minutes, or until tender. Once out of the oven, while still warm toss it in the mixture of Tahini, lemon juice, salt, garlic and left over olive oil. Ready to eat!